Suddendly the IRS and Job Manager quests activated in our game. After having being on haitus from the monorail takedown update, it was activated now. Its the much requested auto collect and send all characters functions! The IRS requires Level 35 (and gives 10 points to Indolence) and the Job Manager requires Level 37. What about the IRS Drone that is in the Animals and Pets section? Unfortunatly at the moment the IRS Drone is not released and it’s unknown when it’ll be but it’ll be released for sure since it’s in the character collection. Join us soon for all the necessary info on this new tool for our town! the first thing i noticed is that the jobs on each of the hour task duration decreases…..100 something for 1hr, less for 4 hours, even less for 8 hours, however not one character i have is on a task. it was even that way in the sample pics. 109 for 1 hour tasks 88 for 4 hour, 68 for 8 hour and decreasing even still for 24 hour tasks. im not sure what the situation is for this, however if i have to pay to send only half my characters on 24 hour tasks when all but 3 dont have 24 hour tasks im not exactly happy with this. yes it helps releaving 50 of 100 characters but even 50 is still time consuming. if it cant do all like it claims, it shouldnt cost. I’m loving this new addition!!!! I dont know if this is a glitch or not but the Job Manager doesnt send everyone on there 24 hour jobs. I hit send everyone on 24 hour jobs and still had a ton of characters just strolling around not doing anything. I click on them and they have a 24 hour job available..
For instance Milhouse, Smithers, Burns, Duffman were all standing around.. along with another 30 or so characters.. I am having the same thing. I noticed many of the characters that don’t get sent are Springfield Heights job earners. But not all of them. I have 3 Springfields and all have the same issue and the same characters don’t get assigned. They are all available at the time and most have a task of that duration so maybe it’s intentional? I’m so excited for these features! I’ve been waiting for them to release something like this! Being able to put everyone on a job at once and collect money from houses will be so helpful! When do we get the IRS droid? Job Manager begins with a short conversation between Kirk Van Houten and an employee at Office of Unemployment which then brings up a new task to assign all available characters to a 1hr job…then a 4hr job. You also have the option to send all available characters on their 8hr jobs or their 12hr jobs or their 24hr jobs. The Job Manager menu lists the number of characters that are able to send on the various jobs, what the resulting combined rewards are (in-game currency/XP) and how much it’ll cost you (in-game currency-wise) to push the button to send everyone on their jobs of the chosen duration(s). 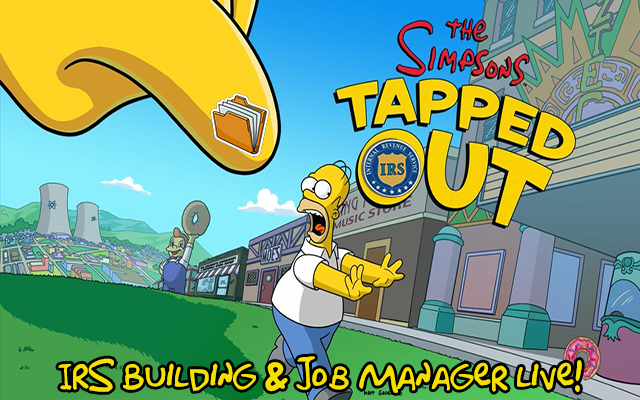 IRS building questline began with you needing to manually collect rent from 20 businesses (like how you normally would) as well as have Homer do a 45-second task x3. After that, the next part of the questline has you sending Homer on a 1hr task, which then brings up a very short conversation between Homer and an IRS collections agent. The third part of the questline (which I’m currently on) as you sending Homer to snitch on the tax evaders (another 1hr task). I’ll update with the 4th part of the taskline when I’m done with this part…unless LPNITA has already posted the entire questline! The 4th part of the taskline is the bulding of te IRS building, it’s an 8×8 dimension building and builds in 6 seconds. When done, you get a short questline to introduce you to the radius collecting of rent/completed tasks. The questline also introduces you to how to increase the radius (which is very expensive past level 5) (for example, the upgrade to level 9 will cost you 7,000,000 to do).. The radius collection is not a collection around a radius of the IRS building (so feel free to place it where you please). The radius is that of around a character or building that is ready for collection. Oh, and collecting in Krustyland also have a collection radius too, but it isn’t nearly as big as the collection radius in Springfield.